Enterprises from across the world have shown great interest in participating in the second China International Import Expo, which is set to be larger in scale and better in quality than its inaugural version last year, said the event's organizers. More than half of the exhibition area has been booked and the number of enterprises confirming their participation has exceeded half of the planned number, said the organizers. 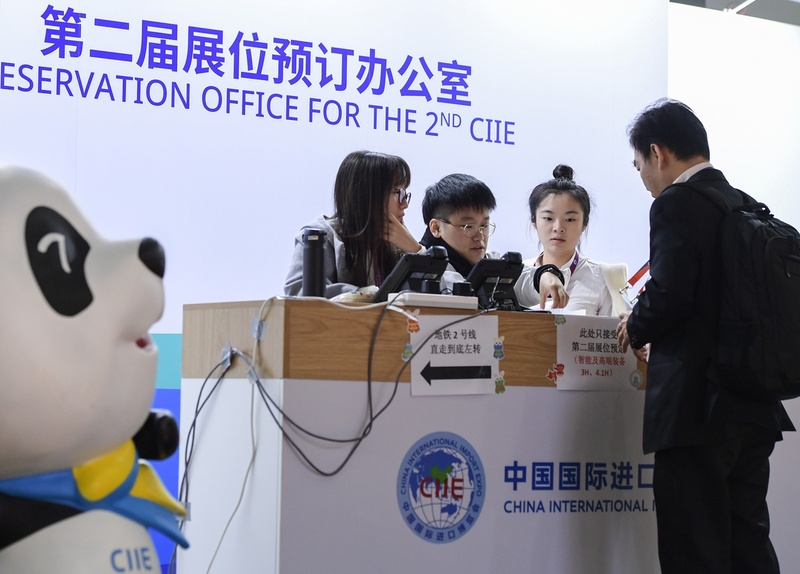 Statistics from the CIIE Bureau show that 812 companies from 72 countries and regions had signed agreements to attend this year's expo as of Mar 15. Altogether they have booked 180,000 square meters of exhibition area, accounting for more than half of the planned business exhibition section, which will be expanded from 270,000 square meters last year to 300,000 sq m this year. At the same time, the number of enterprises confirming their participation in the event, which will include more than 150 Global Fortune 500-listed companies, has exceeded half of the planned number, according to a senior manager of a company responsible for inviting exhibitors to the expo. Those in the fields of food, agricultural products, medical care, and quality life that were very popular among enterprise and individual purchasers at the first CIIE have shown a great interest in particular in participating in the expo this year, according to Zhang Weimin, vice-general manager of Shanghai International Trade Promotion Co Ltd under East Best and Lansheng Group, who is also a national lawmaker. Minister of Commerce Zhong Shan said earlier that some exhibition areas, for instance, healthcare, have been fully booked. "The CIIE is a very good demonstration platform for companies. It not only allows us to demonstrate our latest products and services, but also give us chances to learn from our peers," said Jean-Philippe Poulin, president of Lesaffre Greater China. Lesaffre plans to double its exhibition area from last year to host the Coupe Louis Lesaffre Asia final competition, according to the company. Apart from French companies, enterprises from Italy are also showing interest in participating in the second CIIE. Ettore Francesco Sequi, Italian ambassador to China, said that Italian enterprises will actively join this year's event as they have seen tremendous business opportunities from China's ongoing consumption upgrade and stronger purchasing power. Italian enterprises consider CIIE a good platform to know about the market, added the ambassador. During the first CIIE last year, 130 buyers signed contracts with participating Italian enterprises, whose number stood at 141, according to the CIIE Bureau. Compared with the inaugural expo that took place from Nov 5-10 in Shanghai, the scale of the second CIIE will be bigger and will attract more exhibitors, according to Zhong. Based on a layout released by the CIIE Bureau on Jan 9 to mark the 300-day countdown for the trade show, the event's business exhibition section will feature seven categories as well as an outdoor exhibition area to accommodate more exhibitors. The total area for this section will be larger than the first. Areas dedicated to consumer electronics, smart household appliances and consumer goods are also among those that have been expanded for the second expo, which will occupy three exhibition halls in the National Exhibition and Convention Center (Shanghai). With the addition of the outdoor exhibition area in the venue's northern plaza, high-end equipment will become the largest exhibition category. It will showcase products such as industrial robots, engineering machinery and special-purpose vehicles. Enterprises from across the world have shown great interest in participating in the second China International Import Expo.